In 1980, founding Auxiliary member April Thede began the Miniature and Doll Show at Earl Warren Showgrounds. The show drew 150 dealers and spanned 12 successful years. 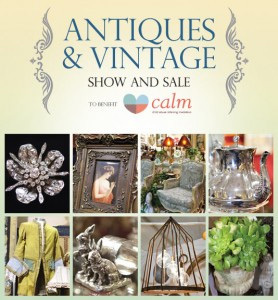 In 1992 April began the CALM Antique and Decorative Arts Show and Sale. This event, more popular now than ever, brings the finest Antique Dealers to Santa Barbara, and is held three times each year, at the Earl Warren Showgrounds. Through countless hours of dedicated work, April and the CALM Auxiliary have elevated small benefit events to thriving events providing much needed support each year for the vital programs at CALM. For more information please call Show Manager April Thede at 805.898.9715 or arthede@cox.net or visit www.calmantiqueshows.com.